With a week remaining until the main event, the 2016 Journeys Alternative Press Music Awards, Fueled by Monster Energy are pleased to announce that, thanks to Amazon Music, fans will be able to watch the live stream exclusively on Twitch, the world's leading social video platform and community for gamers. The live APMAs broadcast will air on the Amazon Music Twitch channel www.twitch.tv/amazonmusic and at http://www.amazon.com/APMAs starting at 7 p.m. ET/4 p.m. PT on Monday, July 18. To watch the APMAs, go to www.amazon.com/apmas for complete viewing instructions. To watch on your TV, download the Twitch app from your TV's app store. Open the Twitch app and search for "amazonmusic." To watch on your mobile phone, tablet or computer, go to www.twitch.tv/amazonmusic on Monday, July 18 at 7 p.m. ET. The Twitch platform is viewable on both iPhone and Android devices. You can also watch the APMAs via the Twitch platforms on Playstation 4, Xbox One, Xbox 360, Chromecast, Fire TV and Nvidia Shield. "Collaborating with an influential and ground-breaking company like Amazon on the official live stream for the 2016 Alternative Press Music Awards is going to amplify our show unlike ever before," said Mike Shea, founder and CEO of Alternative Press. "Since our first meeting, the Amazon team has shown a deep understanding of the Altpress community, so being able to work together with them, as well as our friends at Twitch, Monster and Journeys, packs a powerhouse of a punch. Now music fans worldwide will be able to view the AP Music Awards as all the excitement unfolds in real time." The APMAs are pleased to announce the inclusion of two bonus events surrounding the main awards event, both of which are open to the public. The Musicians Institute Conversation Series Presents: BEARTOOTH and Creative Live x APMAs Educational Conference will offer attendees an educational look inside the current state of the music industry. These events are a "must" for anyone interested in the inner-workings of music business and artist development. The Musicians Institute Conversation Series Presents: BEARTOOTH will take place at the Fawcett Center (2400 Olentangy River Road, Columbus, Ohio) from 5-7 p.m. on Sunday, July 17-the night before the APMAs. The event will feature Columbus natives and APMAs performers BEARTOOTH taking part in an engaging, career encompassing Q&A about the band's formation and what continues to drive them. The Q&A will be hosted by regular MI Conversation Series host and Alternative Press Vice President of Content Development/Senior Editor, Ryan J. Downey. The event will close with an audience Q&A and meet and greet with the band. Please visit https://BeartoothMI.eventbrite.com and enter "MIBT" to receive two tickets! Hurry, space is limited. The morning of the APMAs (July 18), the Fawcett Center will also host the FREE CreativeLive x APMAs Educational Conference from 10 a.m.-3 p.m. Launched in 2015, this conference expands in 2016 to include a day's worth of inspired programming. Arrive to the Fawcett Center ready to engage with some of the most talented producers, mentors, publicists, managers, photographers and artists in your community. Do you want to be a pivotal part of the next generation of the music industry? Then do not miss this event ahead of the third-annual APMAs! Get tickets HERE with code APMACL. NEW SPECIAL GUEST APPEARANCES AND PERFORMERS! The special guest appearances and performances just keep coming! New special guest performers include Andy Black, Neck Deep & Friends, Kellin Quinn of Sleeping With Sirens, Anthony Raneri of Bayside, Bradley Walden of Emarosa, Quinn Allman of VadaWave (formerly of The Used), Mikey Way formerly of My Chemical Romance and Electric Century, John Feldmann of Goldfinger, Christian Coma of Black Veil Brides, Jon Langston, Derek DiScanio of State Champs, Will Gould of Creeper, Jayden Seeley of With Confidence and Alex Costello of ROAM. 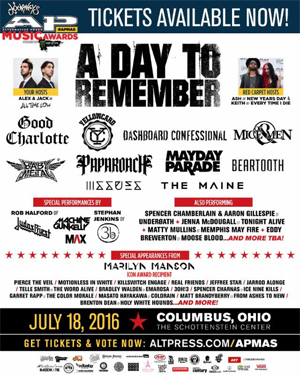 These newly announced performers join headliners A Day To Remember and previously announced performers BABYMETAL, Judas Priest's Rob Halford, Dashboard Confessional, Good Charlotte, Yellowcard, Stephan Jenkins of Third Eye Blind, Of Mice & Men, Papa Roach, Jenna McDougall of Tonight Alive, Machine Gun Kelly, Issues, the Maine, Mayday Parade, Beartooth, MAX, Eddy Brewerton of Moose Blood and Matty Mullins of Memphis May Fire. Newly confirmed appearances will be made by Tyler Posey of MTV's Teen Wolf, plus members of I See Stars, Trivium, Billy Talent, Stitched Up Heart, Waterparks, Too Close To Touch and Against The Current. Additional special guest appearances will be made by Spencer Chamberlain and Aaron Gillespie of Underøath, Pierce The Veil, Motionless In White, Jarrod Alonge, Telle Smith of The Word Alive, Bradley Walden of Emarosa, Garret Rapp of The Color Morale, Spencer Charnas of Ice Nine Kills, Brenton Dean of Holy White Hounds, Matt Brandyberry of From Ashes To New, Real Friends, 3OH!3, Killswitch Engage and Volumes. This year's Icon Award, presented by Equal Vision Records/MerchNOW, will be awarded to platinum-selling rock legend MARILYN MANSON. Alternative Press Music Awards tickets are on sale now via Ticketmaster here. VIP experience packages are available via SoundRink-An Experience Company-and will include limited merchandise, elite access to the red carpet and prime indoor seating and VIP meet-and-greets. The VIP Pit Experience is for the loudest, most energetic fan of the APMAs. This is the best experience for the fan who wants to be so close to the action that they're a part of it, themselves. Tickets are extremely limited! The VIP Pit Experience is located in the center of the largest stage the APMAs has ever had. The stage features a large V-thrust that makes every seat the best seat in the house. Pick up your VIP Pit Experience tickets now via www.altpress.com/pit.